When coffee speaks it says, “you have no idea what I’m worth.” When you buy a cup of coffee the number of things that purchase has to pay for are pretty numerous and diverse. People more numerically inclined than myself have made all kinds of pie charts trying to figure out where that money goes. Wondering whether or not those pie charts are accurate seems to be the wrong question. Coffee pricing has so many layers that it splitting up a circle just doesn’t cut it. Part of the reason straightforward division is overly simplistic is because coffee comes from so many places, and in each of those places everything is completely different. 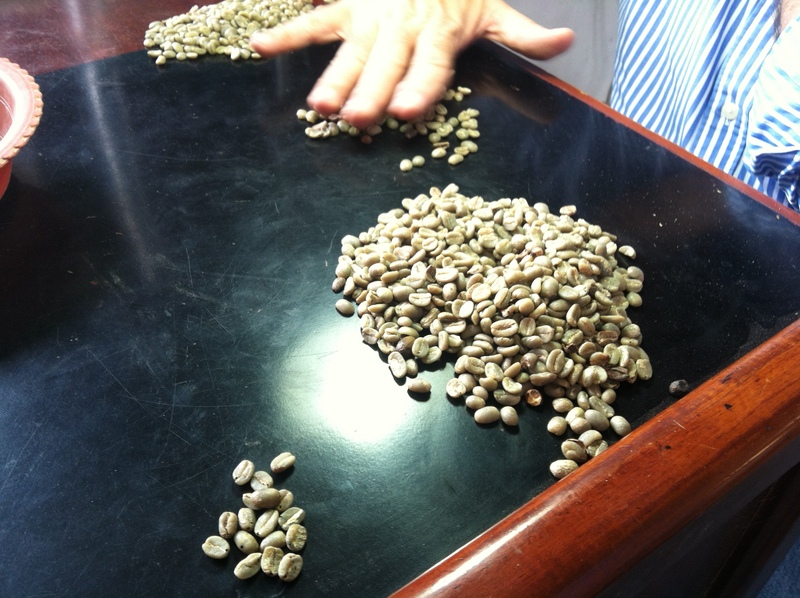 In Costa Rica, coffee is measured by volume and sold as fresh picked cherries. Farmers are paid in Colones. In Colombia it’s measured by weight and sold in dry parchment, basically as a grain. Farmers are paid in Pesos. In Costa Rica quality is assessed by cherry color and density and deductions are often made on a whim (as in, “there seems to be a lot of green in here. I’m taking two cajuelas off the fangea-and-a-half you’re selling me.” In Colombia it’s assessed by a physical evaluation and deductions are made based on the precise percentage of defect-free green beans (as in, “out of 162g remaining after we hulled the initial 200g sample, 12g of beans were defective.”) Coffee is grown in over 50 countries. And every one of them has their own system. So making a neat pie chart of where that $3.50 from your latte or $1.25 from your gas station coffee “really” goes is a little bit wishful thinking. Who gets what cut of the price of coffee, at any point, can depend on which middle man you go to, which coop you sell to, and which currency is being converted to the US dollars of the New York ICE Futures market (which is used as the base to then somehow determine the price of most Arabica sales) and London LIFFE Euronext Futures market (which is used as the base to then somehow determine the price of all Robusta sales, but I don’t know anything about that, since Latin America is the land of milds). Interview notes? Algebra I notes? Math homework? 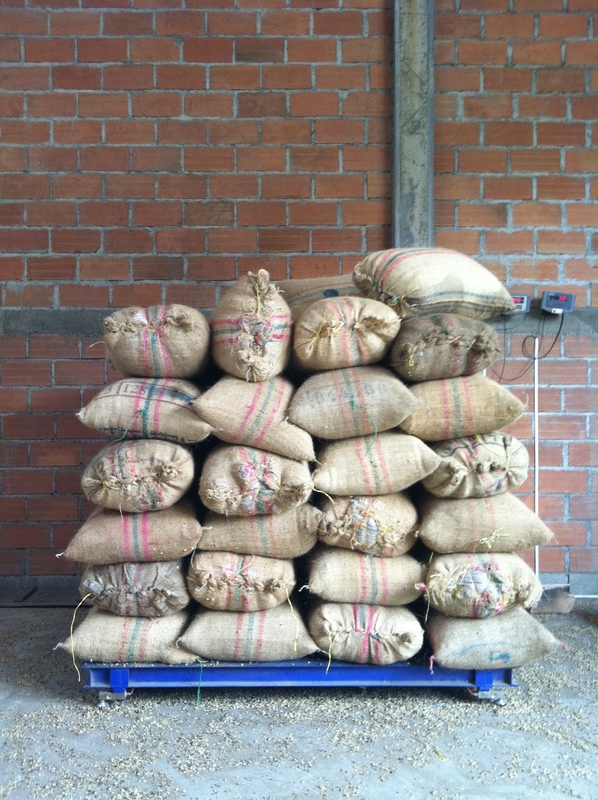 In Colombia, coffee is exported in 70 kg sacks. On the New York ICE Futures Market (operated/regulated by the New York Mercantile Exchange) is traded in dollars per pound. I’m not yet ready to be quoted on the mechanisms of the coffee futures market, but the price is updated every three minutes and represents the movements of trade for “future contracts” in 5 contract months. If you want to check out what’s happening with ICE coffee futures, you can look at a scary chart, which shows the movements for all contracts months. Or you can look at ticker, which just pulls the number from the top of the “Last” column and is arguably the most important: the price right now for the nearest contract month. From this constantly fluctuating magic number, the buyers (coops and middlemen) set prices to producers. Only the presidents/owners/top dogs of the coops and middlemen (which is a bit of a misnomer because every “middleman” is in fact a business with lots of employees, versus a single rogue dude loitering in the shadow of the saloon with his hat pulled low and cash waded in the inside pocket of his coat) know the formulas for getting from those dollars per pound to the price posted in local currency per kilo. And to date none of those top dogs has been willing to sit down and give a gringa a math lesson. I’ve been told- in the vaguest of brushstrokes- that it has to do with, “exchange rates, transportation, milling, sorting, and exportation costs,” (which I’m guessing include taxes and licensing and inspections by Almacafe, the arm of the FNC charged with Colombian coffee quality control). If we’re still trying to keep a pie chart in mind, futures and physicals traders certainly clean up with a healthy price compared with that paid to producers, but their portion of the coffee pie is overtly calculable by the differences between the prices at which they buy and sell- whether what they’re buying and selling is actual coffee or just imaginary contracts. But the one party at the table with the most mysterious portion seems to consistently be the first person who gets the coffee after it leaves the farm, be it a Costa Rican beneficio buying ripe cherries by volume or a Colombian coop buying parchment coffee by weight. Everyone claims to “use the market as a base,” but how these origin buyers get from New York market dollars per pound to local currency per local unit is certainly not common knowledge and seems to leave a lot of room for greedy bites. In Colombia, the price to producers- however mystically and fairly/unfairly determined- is discussed in terms of cargas (125kg) or arrobas (12.5kg). The zone I’m in works in cargas. So when a coffee grower rolls into the coop the price he sees posted on a tablero (sign board) outside is in pesos per carga. If he’s not selling a full 125kg, then the price just gets divided by 125 to become the price per kilo and multiplied by what he has. Note the slight premiums for certified coffees. But it’s not quite that simple. Because the coffee the farmers are brining in is “en pergamino,” “in parchment paper.” And coffee is exported as a hulled green bean, free of parchment paper and ready for roasting. And obviously the buyers won’t pay for the weight of the parchment paper. Coffee is also exported at differentiated prices based on its quality. And obviously the buyers won’t pay the same price for a carga of awesome beans as for a carga of crappy ones. 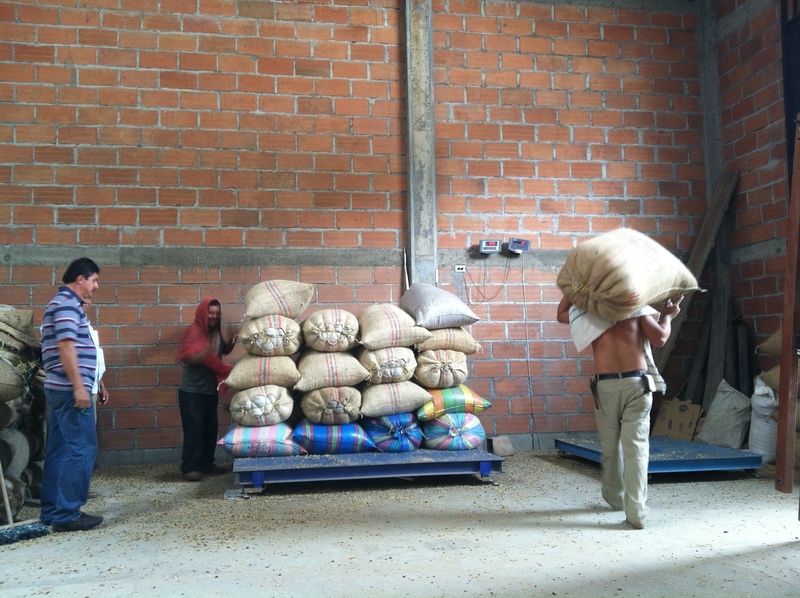 1) The grower shows up at the coop and loads sacks of coffee in parchment onto a scale, where they’re weighed in kilos. 2) An employee then chusa “sticks” every sack to pull a representative sample (5 sacks, 5 mini samples. 500 sacks, 500 samples. The buyer also stabs the sacks (with a cool hollow coffee sack sticking rod) to make sure there’s nothing else hiding in there to bolster the weight or alter the quality. (So theoretically you wouldn’t get away with putting a sack of crappy coffee inside another sack and then just putting pretty coffee on the top. Which apparently people used to do a lot.) Now they also usually open and empty all sacks in front of the seller before handing him/her the receipt. 3) The bowl containing all the stab-fuls pulled from the sacks is then emptied into a “homogenizer,” a nifty machine that looks like it belongs in Dumbledore’s study. Stab-fuls from only a few sacks will just be mixed in the bowl by hand. 4) The buyer weighs 200g from the big sample bowl to use as the representative sample from which he’ll determine the price the producer gets. 5) He then hulls the 200g grams and reweighs it. He usually gets around 160g, meaning around 18-20% of the weight is parchment (and therefore doesn’t contribute to export sales). Let’s say he gets 162g. 6) The buyer removes defects from green beans. That means pulling any bean with broca bites, discoloration, missing chunks, or a weird shape out of the pile. 7) He weighs it again. Let’s say there’s 150g, meaning 12g of defective coffee. 8) He completes the following equation: (Let Y equal grams of defect-free beans) 14,000*/Y= Factor. The Factor is (another) magic number that finally gets to the goal and says how many kilos of this specific coffee- accounting for weight of defects and parchment- it will take to yield 70kg of defect-free exportable Colombian coffee. In this case, the factor is 93.3- so 93. That means it would take 93.3 pounds of this coffee to get 70 lbs of exportable coffee. (*Why 14,000? The grams of defect-free beans (in this case 150g) is out of a sample of 200g. This means that 75% of the weight of the representative sample (and therefore- theoretically- 75% of the total weight on the scales) is exportable coffee. So we want to find 75% of what number will give us 70 to know how many kilos of this coffee we need, if 75% of it is exportable, to end up with 70kg. To find 75% of what will yield 70kg we could do find the following: .75 x Y = 70. And good ‘ole high school algebra tells us that’s the same thing as saying Y = 70/.75. Which is the same thing as 7000/75. Which is the same thing as 14000/150. Which is much faster to do because you just pop the “150g” off the scale after you’ve weighed the defect-free hulled beans to get the magic Factor). 9) The buyer then plugs the Factor into the computer to yield the price paid per carga. (Although this formula is also clandestine, and set by the coop, you can in fact trace it by plugging in different Factors and seeing the prices it spits out. Which I did.) The publicized price is usually expressed in terms of Factor 90. This is not the average Factor, but because it’s low, it looks good and is an “attractive price to put on the board,” as the coop buyer put it. 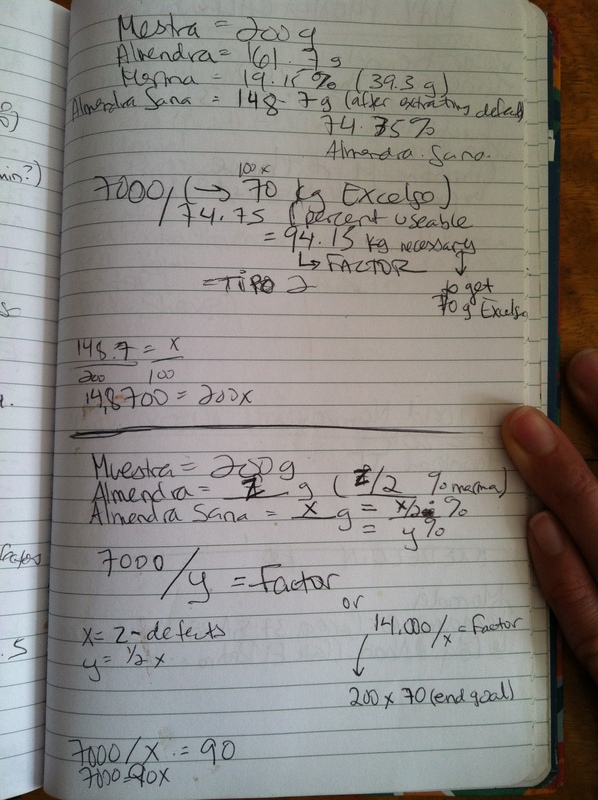 During my “math lesson” visits, the price was hovering around 535,000 pesos per carga, Factor 90. 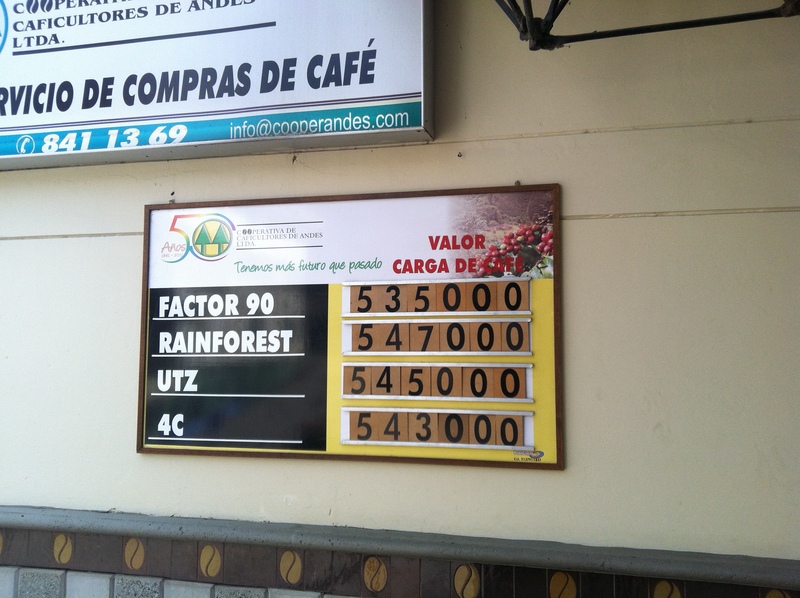 So my Factor 93 coffee might get 522,000 pesos per carga, or thereabouts. 10) Once the computer formula gives the price per carga for the factor, the buyer can then figure out the price per kilo and determine how much to pay the producer. 11) The gofer guys (who are all kinds of badass and do the lifting and hauling of sacks of coffee off the trucks and onto the scales) slash the ties off the sacks and dump them into the big piles of coffee. Mission accomplished. Things work pretty much the same at the middleman’s as at the Coop, except most middlemen don’t have nifty Dumbledor homogenizers, and they don’t use a hidden Excel formula to account for the change in Factor. If I showed up with my Factor 93 coffee they would just take 3% off the listed Factor 90 base price. Middlemen always offer higher prices than the coops (while the Factor 90 at the coop is 535,000 pesos per carga it’s 550,000 at all the middlemen in town). Middlemen don’t offer services like trainings and workshops and school supplies for your kids, so they also don’t have the costs to cover. So why sell to the coop? Because middlemen also don’t offer loans and lines of credit. Only coop members are eligible for those juiciest of benefits, and only members who’ve been selling regularly to the coop. Middlemen also don’t offer premiums for certified coffee. There are some certified growers who are active members in every event and training and are all around coop die hards who sell 100% and don’t even look elsewhere. But pretty much everyone is a member of the one coop in town, and yet 20 some middlemen stay in business in the same town. Most growers split their sales and take advantage of the benefits of slightly better prices while remaining in good enough standing to also take advantage of longer-term coop benefits. Did Juan ever mention he was good at math? If you’re an algebra teacher looking for new ‘real world application’ material, make all your word problems about coffee. 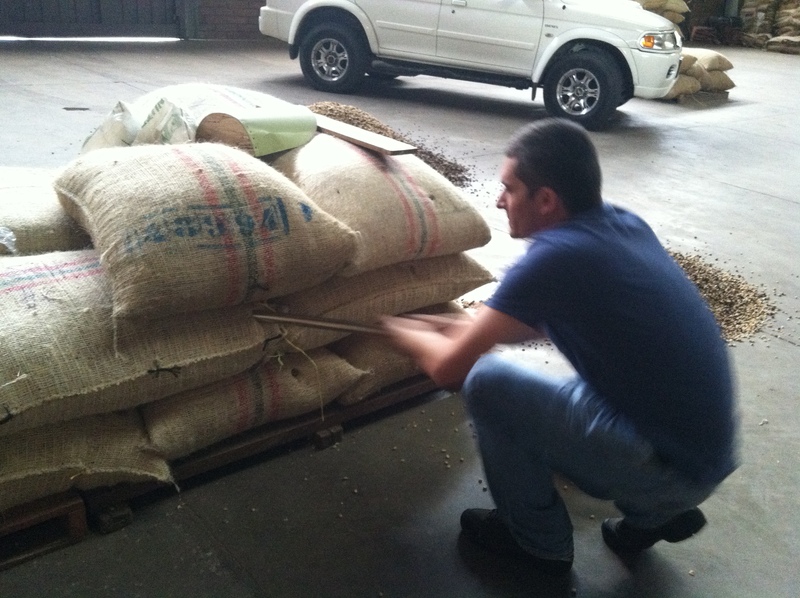 For more pictures illustrating the process of selling/buying Colombia coffee, see Whencoffeespeaks on Instagram.